A block of rooms on campus has been reserved for participants. Accommodations can be guaranteed by filling out the Accommodation Reservation Request Form and faxing your completed reservation form to 819-822-9615 by April 18, 2013. After this date, reservations will be accepted based on availability and the preferred rate may no longer be guaranteed. We strongly encourage participants to buy the meal package (which includes breakfast and lunch for the entire conference). Please note that the supper of the Friday evening of May 24th is the Banquet and that on Saturday evening of May 25th participants are free to choose where they would like to eat. The banquet will be held during the evening of Friday, May 24th. Note that the banquet is free for all participants. We are very pleased to announce that Dr. Bjarni Tryggvason has agreed to be the after-banquet speaker. 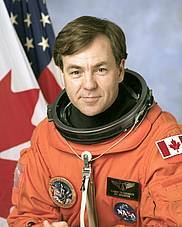 Bjarni is a Canadian engineer who pursued a career as an astronaut with the Canadian Space Agency. He served as a Payload Specialist on Space Shuttle mission STS-85 in 1997, a 12-day mission to study changes in the Earth’s atmosphere. On February 22, 2009, he piloted a replica of Alexander Graham Bell’s Silver Dart, from the ice on Baddeck Bay, Cape Breton Island, Nova Scotia. The flight commemorated the centennial of the first flight in Canada and the British Empire. Bjarni is a delightful speaker who will discuss some of his fascinating life experiences. A list of restaurants in the immediate vicinity of Bishop’s and in the City of Sherbrooke is given below. A PDF version can be found here. Lennoxville Café: 112 Queen, Lennoxville. coffee, sandwiches, patisseries, soups, etc. Wi-Fi. Golden Lion: 2902 College, Lennoxville (819)565-1015. Local sports bar where Bishop’s students hang out. Bistro KapZak: 20 Wellington South, Sherbrooke (819)791-1176, www.bistrokapzak.com Eclectic menu. A Bishop’s physics graduate is the owner and head chef. Rôtisserie St-Hubert: 3070 King Ouest. (819) 563-5112. ‎ ‎ Completely renovated and good food. Everything: chicken, fajitas, steak. They have a bar. Restaurant Bâton-Rouge: 2844 King Ouest. (819)346-9888. Ribs, steaks, burgers, chicken, pasta, salads. Bishop’s University Bookstore (Follett’s): Marjorie Donald Building (Student Union), D4 on campus map. Not open on Saturdays. There is just one company that serves all of Sherbrooke. Since service can be slow, it is best to reserve ahead of time.